Have you heard these or similar comments from your employees in reference to their coworkers? 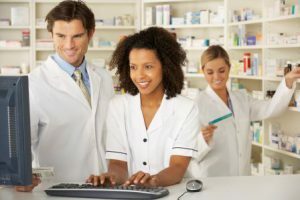 Lack of positive dialogue and interactions between associates and particularly the pharmacy and front-end staff adversely affects employee morale and performance, customer satisfaction, and ultimately, your bottom line. Are all associates aware of store sales and promotions? Does everyone know where key sales items are located in the store? Have they been alerted to important out-of-stock situations that may be of concern to the customer and do they know your policy in regards to out-of-stock items? Can each team help support some of the challenges the others face in regards to customer service, especially at peak rush times? Can each member respond to challenging customer interactions concerning the other department in a positive, supportive manner? Do employees understand management’s expectations of each team member? Do the full- and part-time employees understand the similarities and variations of expectations between their positions? Schedule associate meetings. Even brief, stand-up meetings out on the store floor, prior to opening, can be useful. Topics should include upcoming promotions; highlighting recent successes such as a well-handled customer interaction or one that might have been better dealt with in a positive manner. Another type of meeting topic, which is embraced here at HRG, includes sharing personal celebrations such as birthdays, anniversaries, or anything else an associate would like to celebrate. For more tips see my co-worker Mary Hart’s blog post on employee meetings. Post weekly communications in areas that all employees frequent regularly including breakrooms, time clock area, and pharmacy. These posts should include reiterating topics mentioned in the stand-up meetings for any employees that were unable to attend and updates about promotions and sales. Implement some level of cross-training for all employees to create understanding and compassion among coworkers. This could be as simple as scheduling some dedicated time for employees to observe activity in other departments to provide a better understanding of their coworkers’ responsibilities. Pharmacy clerks and techs might work alongside the employees at the front register or front and face departments, even outside of the OTC sections. Conversely, front-end staff should observe the pharmacy team in action during a peak hour and a slower time when they could ask questions. Fostering inter-store communications and mutual understanding in your store helps create a healthy, positive environment and is a win-win situation for you and your employees, customers, and business.